Hi everyone!!! I was on vacation for the past month, which is why you haven't heard from me here. We went to Prague and to Haifa in Israel, both of which were awesome. I was able to keep up with my Facebook page and share lots of GMO news from the past month, which included a report from the National Academy of Sciences declaring GMOs to be as safe as conventionally bred crops and a statement from the Royal Academy calling for a review of the cultivation ban in Europe. It's been a busy month!! 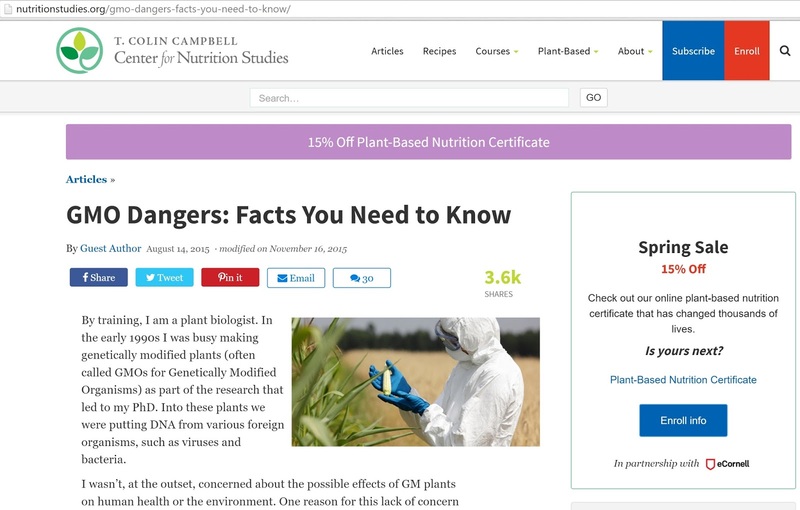 I also got an email asking me to review this article entitled "GMO Dangers: The Facts You Need to Know", which is the topic of today's blog. as if it were a stick of dynamite? Is the corn radioactive? Is hazmat dude allergic to corn and has to wear a filter? The article, written by Dr Jonathan Latham, starts by outlining his credentials and how his concerns about GMOs grew over the course of his career as he realized the complexity of biological systems. I think that a scientist would have to be very arrogant not to share this perspective. Nature is beautiful in its diversity and, as a scientist, I'm awed daily at the complexity and elegance of the smallest of proteins. The fact that a bunch of different molecules make something as amazing as my kid is astounding. But that doesn't mean that we should halt progress merely because nature is complex. Dr Latham goes on to highlight that the risk assessment process in the regulatory process is flawed and that the data is often messy. I happen to agree with this, as do many others, as evidenced by the fact that US Biotech regulations and agencies are being restructured. I hope that Dr Latham provided his input on how these should be improved during the open comments period. But the fact that the risk assessment process is flawed doesn't mean that GMOs are dangerous, particularly when compared to other crop breeding processes. Dr Latham then starts outlining the science-based "Dangers of GMOs". I've categorized each "danger" according to the trait. Italicized phrases are from the article. Regarding the Bt trait, which is an insecticidal protein produced by some GMOs. The gene is from the Bacillus thuringiensis bacterium. It's very important for the next few bullet points to keep in mind that the insecticidal protein that is produced by the Bacillus thuringiensis bacterium is a common pesticide used in organic farming. So any concerns about the safety of the protein should also be a concern for produce grown using organic standards. "Bacillus thuringiensis is all but indistinguishable from the well known anthrax bacterium". The only possible reason this sentence could have been written is to create fear. A protein that is encoded for in a GM crop is not equivalent to the organism it came from. It's like saying that a wire is the same thing as a car, and then trying to scare you into not using wires by telling you numbers for car accidents. "Another reason is that Bt insecticides share structural similarities with ricin." This is altogether a stupid argument. It's like saying that eating mushrooms from the grocery store are dangerous because there are poisonous mushrooms out there. "A third reason for concern is that the mode of action of Bt proteins is not understood." In such a case, why is it used in organic farming? Much is understood about the proteins. Of course, we could always learn more, but that doesn't mean that it's dangerous. "This resistance is an invitation to farmers to spray large quantities of herbicides, and many do." Why on earth would a farmer spray any more than is needed and decrease their profit margin? But I can imagine that some farmers may not follow proper guidelines, but then how is this an issue unique to GMOs when there are non-GMO herbicide tolerant crops? "Glyphosate has been in the news recently because the World Health Organisation no longer considers it a relatively harmless chemical." Actually, the most recent statement from the World Health Organization says that: " ... glyphosate is unlikely to pose a carcinogenic risk to humans from exposure through the diet." A lot about the dangers of glufosinate. I haven't written about glufosinate crops because there doesn't seem to be much hoopla over them. My guess is that it's because a) it's not made by Monsanto (it's made by Bayer) and b) they aren't used as much. Looking at the EPA's data, only ~3 million pounds of glufosinate were used in 2013, whereas over 250 million pounds of glyphosate were used the same year. The section about the dangers of glufosinate resistant crops sound eerily similar to criticisms of Round-Up Ready crops: that we're eating small amounts of these pesticides that are absorbed by these plants over time and that these trace amounts will negatively impact our health. There's no evidence to this. The World Health Organization has also examined evidence to determine the likelihood of a health impact from long-term exposure to trace amounts of glufosinate, and has stated that it is "unlikely to present a public health concern". A terrifying paragraph about how a viral gene is possibly being made in GMOs. Except it's not. The paragraph is based on this paper. Basically, when a transgene is added to a crop's DNA, a segment of DNA known as the promoter region is also added. A promoter dictates when and where a gene should be turned on. Its DNA sequence isn't part of the protein that's made. If you think of the protein coding part as a factory, then the promoter would be the loading dock that dictates when things can go into the factory and is also the place where things that go into the factory get assembled. The paper highlights that one of the promoters that are commonly used in transgenic crops could possibly encode for a small portion of a known viral gene, because the DNA sequence of the two have some similarities. The paper does computational analyses to determine how similar the promoter is to the viral gene, and what would happen if the viral gene actually got made. They computationally examine questions such as: is the protein structure similar to known allergens? Is the protein structure similar to known toxic proteins? Their conclusion is that, if the viral gene is ever made, it is unlikely to be an allergen and unlikely to be toxic. Most importantly, the paper states that the likelihood of the viral gene ever being made is low. Folks... Farmers around the world have been fooled. GMOs pose no benefit to them!! Dr Latham highlights that the real reason that GMOs exist is because companies want intellectual property rights!! In fact, farmers must have been hypnotized into purchasing GM seeds season after season. Why else would they buy them, right? Dr Latham ends with the following: "I left science in large part because it seemed impossible to do research while also providing the unvarnished public skepticism that I believed the public, as ultimate funder and risk-taker of that science, was entitled to." I find that hard to believe. If you genuinely believe that the public is being put at risk due to GMOs, why wouldn't you stay in science and demonstrate the risk/harm? It's like saying "As a water safety researcher, I left Flint because I was skeptical about the government's claims of water safety and I believed that the taxpaying citizens of Michigan deserved better." Anyway, those are all my thoughts on this post. When reading posts such as "GMO Dangers", I think that it's really important to distinguish between the potential or possible dangers, and real evidence of harm. If you look through websites like the Institute for Responsible Technology, you'll note that every other sentence about GMOs is about how they "may" or "could" cause harm. Such articles/website use alarming language to instill fear.